As the working world spreads its fingers across the globe, the distance employers reach for potential employees is exploding. Companies based on the West Coast are just as likely to interview a candidate from Illinois as California, or even beyond the American borders. This geo-diversification surge leads to a new problem: how do you economically arrange the interviews to hire the best possible match? Fortune 100 companies can afford to cart twenty college students across the country and hire two of them, but for the majority of companies that isn’t practical. 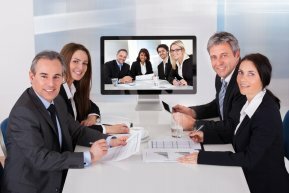 Increasingly, they are turning to virtual setups, such as phone, VOIP, or video interviews over the Internet. Between 2011 and 2013, video interviewing increased 49 percent, and 60 percent of hiring managers used video to interview candidates, according to a PGI study. These kinds of interviews aid both the interviewer and interviewee in ease, comfort, and rapidity of the process, only matched in speed by how fast they’re catching on. When you secure a job interview more than a state away that you have to attend in person, you immediately knock out one or two days from your schedule for only an hour or so with your potential employer. Few people have the luxury of free time and will have to wade through a swamp of hassle: rescheduling meetings, notifying professors of missed classes, and making sure the dog is walked. Virtual interviews are flexible and quick, only taking an hour or so – maybe less – from both the recruiter and the candidate’s day. This can make it faster for both parties to meet, shortening the overall recruitment process and getting you to a decision sooner. easier to set the time for the earliest and easiest convenience for both parties. You can also get a quicker turnaround, since the recruiters spend less time in the interview process for the other candidates for the position, as well. The major contributor for companies to push for a shift to virtual interviews is cost savings. Travel expenses – planes, hotels, shuttles back and forth to those locations – the recruiters, the hiring managers, the facilities the interview is conducted in; all of these elements go into the cost of a traditional interview, which can add up to the thousands. Sometimes the total cost of bringing a person on board can be over $50,000, according to Tembostatus, although most studies put it around $15,000. Of course, the alternative of a video interview isn’t completely free – there is still the wage of the interviewer, the equipment they conduct it on, and so forth – but that total is far less than a plane ticket alone. Video interviews with Bluejeans, for example, have a software licensing fee attached to them, delivering a more dependable tool that is less prone to the typical withdrawals of video chats – dropped connections, platform restrictions, and so on. Video interviews are less of an investment than flying people around the country, and so put less pressure on both parties to force a match where there isn’t one. Spending two days on a one hour interview has more downsides than inconvenience and expense. Throwing all of those resources at a candidate raises the expectations by the employer adding to the stress on top of the anxiety that comes with any interview. It also puts an extra burden on the recruiter to only invite candidates they know they’re confident in, and adds heavy consequences if there is trouble securing the best fit for a position. With virtual interviews, the expectations are loosened, and a more relaxed conversation about the company and the candidate is possible. Instead of nerves and high hopes fouling up the communication airways, more comfortable, more direct dialogue can occur in locations that are the most natural on both ends. It also gives recruiters the freedom to reach out to anyone that they are interested in, even if they’re not the perfect candidate on paper, and explore interesting choices in personnel that would have been overlooked before. Connecting previously untouched markets and bringing them together to do something new is kind of the Internet’s thing, and like the rest of communication and networking, the limits of searching for jobs and staffing them are still being tested. Employers have started to use Snapchat for applications and are posting video job descriptions instead of confusing essays about a listing. In the near future, we could be using smart watches to set the time and date of our interviews and sending videos to accepted candidates congratulating them instead of letters, as predicted by Mashable. The world of recruiting is always changing, and you have to be quicker, cheaper, and better in order to keep up. Jake Anderson, awestruck by Star trek as a kid, has been relentless in his pursuit of covering the big technological innovations which will shape the future. A self-proclaimed gadget freak, he loves getting his hands on every piece of gadget he can afford. You can follow him on Google and Twitter.